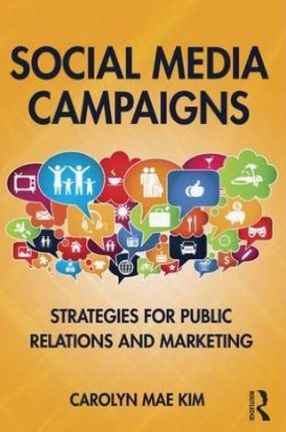 As I mentioned in a previous post about my Social Media class, this semester I’ve adopted Carolyn Mae Kim’s new textbook: Social Media Campaigns: Strategies for Public Relations and Marketing. To put it simply: I’m so glad that I finally found a book like this. Kim’s book is among the most thorough and clear book I have read in terms of providing an overview of how to research, plan and execute a strategic social media campaign. For me, it is the end-to-end guide to help my students through understanding the process from start to finish. If you’re familiar with strategic communication campaign planning, you’ll know key elements discussed in this book – from background research and audience analysis to goals, objectives, key messages, strategies, and tactics. And Kim does a wonderful job of explaining them to students in clear, to-the-point language. Further, she does a wonderful job tying them directly to social media planning. Because my social media class is situated after the principles of PR course and before our campaigns class, I believe this book is going to provide a strong transition from exposure to these concepts in PR that will help students build towards mastery and execution of these concepts in the campaigns class (In the social media class, I provide background research as well as the class campaign’s goals and objectives – though the students do complete their own social media audit and audience personas). While there are many gems in this book, here are a few highlights that jump out to me. From the beginning, the book talks about how social media strategy needs to align who the organization is and why they exist. This should be a point of emphasis in any social media training. Social Media Listening – The second chapter on listening provides a comprehensive plan for developing and executing a social media listening plan. A strength is that students can complete much of what Kim discusses using free social listening or analytics tools because the concepts can carry across platform. The instructions for analyzing share of voice, for example, can be easily done in a spreadsheet program. Here, Kim has inspired me to integrate teaching students to calculate SOV into my research class for next semester. Brand Persona – Chapter 3 gets students thinking about building the social profile of the brand and key considerations such as brand persona and voice (relating back to point #1 above). We talk about these concepts in my class – and I think the way Kim explains them really rounds that out. Content & Engagement – In discussing how to create engaging content that the audience will love, Kim goes beyond case studies as examples into key concepts of credibility, trustworthiness and more to explain to students tactics for achieving desired brand positioning related to these concepts. Chapters 5 cover implementation of your social strategy. Many tips and tools are discussed from creating an optimal content calendar to using alerts and harnessing social listening dashboards. But the book also covers important considerations such as crises and the inevitable social media fatigue audiences will feel. Chapter 6 covers evaluation. This chapter provides a great discussion of the intersection of social metrics and key outcomes related back to your campaign’s objectives. Lastly, I like that this book is concise while packing essential information. It is digestible, tightly written and everything ties together. An someone who puts a lot of emphasis trying to show my students how everything connects between my classes, I love that. And in an age where we are seeing many students who aren’t reading class texts, it’s all about packing a punch in an approachable package. I’ve been teaching social media campaigns for 3 years, and I’m excited about the important details I picked up from this book. In several cases I found myself jotting notes of things I ways I plan to use things from the book to enhance my class or wishing I had the time and space in my class to integrate key concepts we simply don’t have time to discuss in the course of a semester. I’m very glad that my students will get a chance to read this book and get exposure to those things we don’t get to during class time.